(Updated on 17.09.17). 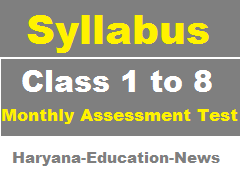 Download Monthly Syllabus for Class 1st to 8th & Class 6th to 8th in Haryana Govt. Schools for 2017-18. State Council of Educational Research and Technology (SCERT), Haryana released Syllabus for class 1st to 8th for Monthly Assessment Test in Haryana Govt. Schools. It is notable that School Education Department, Haryana has decided to conduct Monthly Assessment Tests in Govt. schools under CCE Programme. The SCERT has uploaded monthly distribution of syllabus for class first to eighth. Check and download here month-wise syllabus for class 1st, 2nd, 3rd, 4th, 5th, 6th, 7th & 8th for the session 2017-18. The monthly assessment tests will be conducted on the basis of the syllabus provided by SCERT. So all school Heads and Teachers are advised to check this monthly distribution of syllabus for class 1st to 8th so that they can teach according to this syllabus and the students can prepare in a better way for monthly assessment tests. Download here monthly syllabus of class 1st to 8th for all govt. primary and middle schools of Haryana. New syllabus for the session 2017-18 has been uploaded by the Department. Download the syllabus uploaded for the session 2017-18 for class 1st to 8th for Hindi and English medium.